Carolanne R. King was born and raised right here in Middle Tennessee. Carolanne is originally from Marshall County (Lewisburg) but currently resides in Spring Hill. Carolanne studied criminal justice administration and sociology at Middle Tennessee State University. After graduating with a bachelor’s degree Carolanne attended The Nashville School of Law. 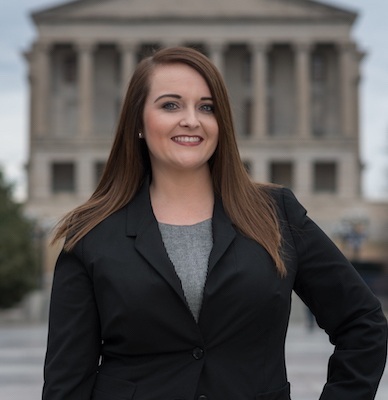 Carolanne is admitted to practice law in Tennessee and is a member of the Tennessee Bar Association and the Tennessee Young Lawyers Division. Carolanne has been with Freeman and Fuson since January 2012. Since that time she has worked on many complex and challenging family law cases with both Mark and Joseph. Her primary case focus at Freeman & Fuson is family law, including, divorce, post-divorce matters (modification), child custody/support, contempt, parental relocation, adoption, father’s rights, grandparent’s rights, and step-parent’s rights. Carolanne also handles dependency and neglect matters in Juvenile Court. Carolanne is frequently in court and has experience practicing family law in almost every county in Middle Tennessee. Navigating family law matters can be overwhelming and stressful for everyone involved. Family law matters are often delicate situations, which need to be handled by someone who is dedicated to providing compassionate legal representation. Matters involving families often have two sides to them, a legal side and an emotional side. It’s not uncommon for these two sides to overlap and then become difficult for clients to manage. Carolanne is dedicated to helping clients navigate their feelings and emotions while providing competent legal representation that is in their best interest.